Info "...And when I awoke, I was a fish! Don't leave me alone... I don't know my way around!" Stay in School is one of Wario-Man's microgames in WarioWare: Twisted! The player must tilt the Game Boy Advance to have the Wario fish stay with the swarm. If the swarm goes off-screen leaving the Wario Fish behind, it's a loss for the player. Level 1 - The school of fish is quite large. Level 2 - Half of the fish are gone. 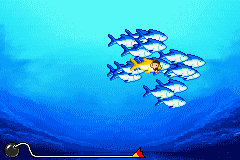 Level 3 - Two-thirds of the fish are gone. This page was last edited on November 17, 2018, at 03:20.